Now, at the time I was a geeky, sarcastic little thing well ready to be done with high school life, and I was hardly broken up about the prospect of missing prom, senioritis, a large picture in the yearbook and all the other useless things I hadn’t looked forwards to in the first place. I didn’t even much care about missing graduation; as a member of the school choir, I had attended the previous class’ graduation, and it wasn’t like the substance would be different just because my name would be in the program. Ah, but that cool facade didn’t mean there wasn’t just a touch of wistfulness, though. Not much – not nearly enough to shade into anything approaching regret. (Saying I was well ready to be done with that stage of my life is technically a massive understatement.) 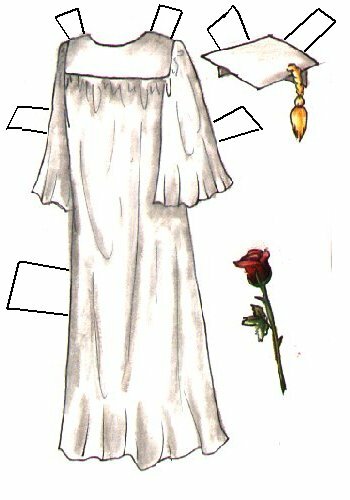 But just enough to draw the cap and gown I wouldn’t ever wear for my paperdolls. It all ended well, though, as I did get into the University of Michigan… Although, from the safe vantage point of having successfully graduated a decade ago, I can say that only applying for that single school may have been the dumbest, most overconfident thing I ever did in my life – I don’t know what I would have done if I hadn’t gotten in! 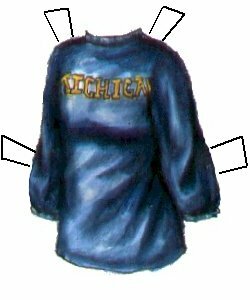 My mom bought me this celebratory Michigan shirt, and I did have it for a very long time, but it wasn’t so shiny in reality. I drew everything shiny at the time, even blue jeans. These days I compensate by just simply not drawing blue jeans. Life is too short for such dullness, pass the ribbons. The green dress is quite beautiful, I hope you find its twin. I wanted to graduate high school early but the administrators wouldn’t let me even though I was picked on a lot. I did go to my graduation though, and our gowns were a horrible shade of yellow because the school colours were maroon and gold. Why they choose the yellow, and not maroon is beyond me. I’m with you on not wearing a cap and gown for graduation. Since I homeschooled, I got to wear whatever I wanted, so when my family was down at Disneyland, I picked me up a cap with Mickey ears and wore that instead. Oh, and if I ever find this green dress, I’ll let you know! Oh, overall jumpers… I remember those. Anyway, amazing stuff. Blast from the past! One of the people at this big “can Liana graduate early” meeting was the school counselor. She spoke up quickly when she saw that none of us-you-me-your dad got the joke. We were sitting in shock at what he said. She pointed out his OSU ring and said that there is a long standing rivalry with Michigan. Not a college football fan in the family. Still I’m grateful you got to do what you wanted and I appreciated the principal’s & counselor’s efforts on your behalf. Oh, I remembered it all wrong then! :) Thanks for the updated story! I had a dress very much like your green one Liana, only mine was gold velvet. Guady yes. Awesome, heck yes!